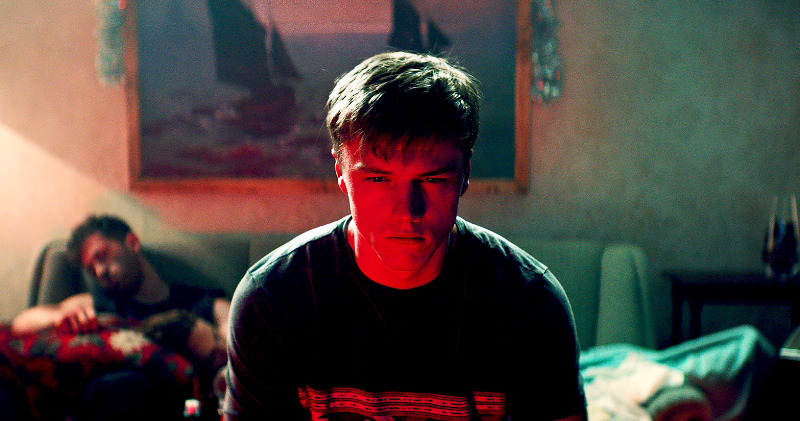 My first feature film, AWAIT FURTHER INSTRUCTIONS, finally reaches UK cinemas and download services this Friday. The film is an unusual sci-fi chiller about a dysfunctional British family who wake up on Christmas Day to discover they’ve been imprisoned by sheets of black metal which entirely encase their house. As the panicked family try to work out what’s going on they turn to the TV and find a single text message: “STAY INDOORS AND AWAIT FURTHER INSTRUCTIONS”. Throughout the narrative these instructions become progressively stranger and more unhinged, gradually pitting family members against one another until violence inevitably breaks out. Now, I say “finally arrives”, as the film has taken… a while… to get here. Ten years, in fact, since I first had the germ of the idea. Often, in my experience, inspiration can be a surprisingly ramshackle, bodge-it process, and story concepts are, more often the not, lashed-together edifices combining bits and pieces of other ideas gummed together by some general themes, unformed characters, and a bit of wishful thinking. They might eventually grow into something beautiful, but their birth is rarely easy, and can happen over an agonisingly long time. And with that, basically, the whole plot of the movie dropped into my mind in an instant. I’m endlessly fascinated by how contingent on place and time and context creativity can be. How connections form in your mind that are almost accidental. So, if you hadn’t taken that particular short cut on your way home on that particular day, and seen that specific argument on the street, or an oddly painted bike, or a parrot staring wistfully out of a window, then your story might be completely different. Being trapped with your extended family at Christmas. Literally. Critics sometimes dismiss the genres of Science Fiction and Horror as mere escapist exercises, but, actually, genre films are a fantastic arena for talking about the biggest themes in society. Again, this desire to ground our film in concrete, real world topics was also influenced by the time period. As 2008 wore on the growing financial crisis became more and more apparent and I was struck by the overwhelming power of the power of the media in our lives: people hearing about the instability of banks on the news, then queueing up to take their money out the next day, images of which were screened on the news… which, in turn, caused more people to go take their money out in a feedback loop! If two experts argue whether mobile phones give you brain cancer or not, who do you believe? I don’t know? Do any of us in this world of ever greater and greater complexity? Whether to follow the advice on the TV is exactly the central dilemma for the characters in AWAIT FURTHER INSTRUCTIONS. During the long development of the project we occasionally worried about focusing too much on the influence of television as everything went digital. However, our themes of authority and authoritarianism, toxic masculinity, media manipulation, prejudice and paranoia have only become more timely, reaching their peak as we release in this age of Fake News and Brexit. As a writer my core influences are a stew of largely demented kids TV from the 70s and 80s, such as Tom Baker-era Dr Who, King of the Castle and The Children of the Stones, along with latter additions, novelists like H.P. Lovecraft and Clive Barker, then screenwriters like Joss Whedon. However, you can also add to that gumbo The Great Gatsby, the films of Wes Anderson, the Larry Sanders Show an idiosyncratic mix which may help explain some of my weirder story fixations! As I began working with producer Jack Tarling (God’s Own Country), and director, Johnny Kervorkian (The Disappeared) on AWAIT FURTHER INSTRUCTIONS we drew in other sources of inspiration: there’s a lot of David Cronenberg in there, some early-period Mike Leigh even, and a dash of creepy Japanese oddity Tetsuo: The Iron Man. There aren’t any jump scares in AWAIT FURTHER INSTRUCTIONS, I’m pleased to say, but instead a mood of mounting dread akin to John Carpenter’s ‘The Thing’ (one of my all-time favourites), or Frank Darabont’s version of The Mist. It’s a film about character interaction – that’s principally where the tension grows – and we spent a great deal of time in the development of the script fleshing them out into fully rounded and conflicted people, something horror films often neglect. As it’s my first feature film I never tire of seeing how my words have been brought to life and taken to the next level by our amazing cast of performers, David Bradley, Sam Gittens, Abigail Cruttenden, Holly Walsh, Grant Masters, Neerja Naik and Kris Saddler. It’s been very heartening how well the film has been received so far – including a Critic’s Pick in the ‘New York Times’ – and almost all audiences and reviewers have picked up on all the ideas outlined about which lurk just beneath the surface. It’s been a long ten years, but finally it’s led to the best year of my writing career to date. Sometimes waiting for things – and instructions! – is worthwhile. AWAIT FURTHER INSTRUCTIONS plays at selected cinemas from Friday 7th December, including the Tyneside Cinema on Friday 7th, Sunday 9th, and Thursday 13thDecember. as well as the Everyman Cinema in York on Tuesday 11th. The film will be available to download after the 7th as well from Amazon Prime, iTunes, and Google Play.